In the great Sonoran Desert, in the Southwest region of the North American continent, the indigenous people once known as the Papagos lived for thousands of years. Their land, known as the Papagueria, extended south to Monterrey, Mexico, north into Central Arizona, west to the Gulf of California and east to the San Pedro River. Descended from the Hohokam, and now called the O’odham, the native people have adapted to the changes thrust upon them by two different governments, the U.S.A. and Mexico. The division of their native land has meant that it has all but disappeared south of the border and access to their ancient land and holy sites has been restricted for tribal members on both sides. They are a people, divided. But the O’odham persevere and continue to invent new and different ways to adapt, while preserving their native customs. One of the recent inventions attributed to the O’odham is a form of music called “Waila”. Waila music was derived from both Northern and Southern European music, combining dance styles from the North of Europe, the polka, schottisch, mazurka and two-step with the stringed instruments favored in the South of Europe, such as guitar and fiddle. Some have described Waila music as being a narrower interpretation of the Mexican Norteno music heard throughout the Sonoran region, but others disagree, insisting that it is a unique genre that utilizes similar instruments. 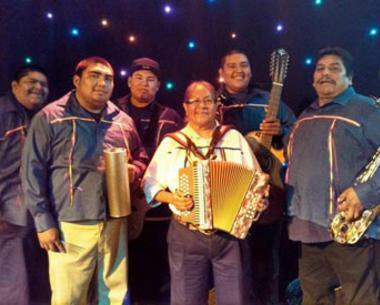 Within the last generation or two, the accordion has a been a featured member of Waila bands, as well as the saxophone, bass guitar and drums. It is only recently that the native people have added singing to their Waila performances, but more often do not sing, for O’odham cultural reasons. Waila is commonly, but incorrectly called “Chicken Scratch” music, so named because of the way the dance resembles the strut of a chicken as they march in their peculiar fashion. Waila is the music that accompanies the dance, and is a derivative of the Spanish verb, bailar, (to dance) but, to English speakers, heard as a “w” sound. Over time, it came to be known as “waila”(pronounced wy-la). It is common to see Waila bands accompanying dancing at local establishments on any Saturday night. 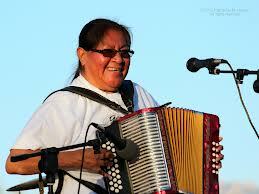 What is unusual about Gertie Lopez is that O’odham women are not usually featured as bandleaders in Waila groups. Gertie’s interest in music naturally evolved because of her Father, Augustine B. Lopez, Sr. and his participation as a Waila and Mariachi bandleader.